Hotel Pullman Cologne. Book your hotel in Cologne now! This hotel proves that it is possible for a central location to be peaceful. Right in the city center of Cologne, the Pullman Cologne hotel is conveniently close to all of the attractions that make this city so famous, whether it's the cathedral, the River Rhine or the old town. When inside the hotel itself, you will feel the city's energy transform into an atmosphere of relaxation. With its spaciousness and its elegant flair, the hotel creates a stylish space for creativity and exciting encounters. 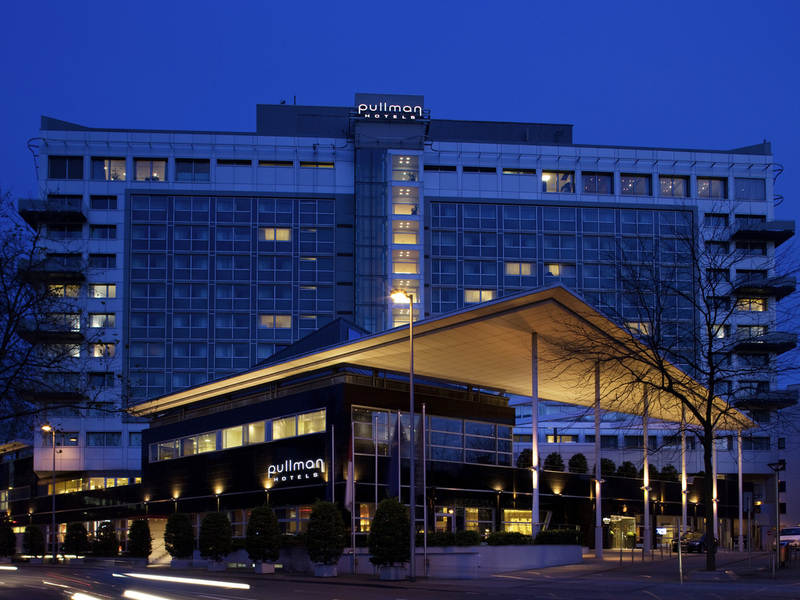 The Pullman Cologne is an upscale business hotel well situated in the heart of Cologne. With numerous culture, nightlife, shopping and business options within the vicinity, guests come for business and pleasure. Rooms are equipped for ultimate comfort The rooms in this elegant, design-focused hotel are modern, some featuring a rain shower. Guests seeking peace and quiet will find what they are looking for in the hotel's spa area, and can round off their stay with a massage. The stylish atmosphere and spaciousness of our hotel is reflected in the 275 rooms including 11 suites. Bright lighting, individually controlled air-conditioning and modern furnishings all mean your stay is sure to be a pleasant one. A Cologne institution. Drink a freshly pulled Kölsch beer or a glass of wine with your tapas - if the weather is good, you can enjoy our summer terrace. One of the best buffet breakfasts in the city with extracted honey. For late risers, our buffet breakfast is served until 11am on Saturday and until midday on Sunday. Modern big city flair at LAB12: Cool vintage design, trendy music and innovative cocktails, with a sensational view over Cologne from the top floor. The service and the Hotel are very nice. The service and the room are very good. The Hotel staff were very friendly and always able to help. It is a pleasant stay for me. I would love to stay in Pullman next time when I visit Koln. The hotel is well situated and staff are professional and efficient. Delightful friendly and helpful service from the young lady when I checked-in Mon morning (sorry, didn't catch her name) and in the bar in the evening, but much less friendly front desk assistance on Tue evening. Hotel is nice but service is not what it should be at a hotel with like the Pullman. Check-in very unwelcoming, no welcome drink, service in on the roof bar shameful, (two drinks for two people came in a 15 minutes time gsp after so we could not drink together), mistake on the check out bill, the list continues.. Simple - everything was where I expected and worked. Loved that the mini bar was free for our room. I did book this hotel for how close it was to colonge main attractions. Online says theres a indoor pool found out it's just a large sauna in there spa so didnt try to take the whole family to it. Staff were friendly and went the extra mile. Room and decor was a great standard. Great location. We always enjoy staying at your hotel. We enjoyed having a welcome drink as we are silver members and a early check in. On arrival, check in for warm and helpful, including ensuring I was enrolled in your loyalty program. I was impressed and it was efficient and helpful. The room and facilities were outstanding, I especially liked the bathroom. Lots of toiletries and handy essentials that most other hotels have stopped supplying, like nice coffee in your room and cotton buds. Breakfast was very good, nice variety and a great self service coffee machine, only comment is that the layout can cause bottle necks at time when its busy. On checkout the experience was very different to check in, it was a little officious and I felt like I was putting the person out and this was a bit of a surprise, to be honest, I took this as an isolated experience and suspect this isn't the norm. If the checkout was as friendly as the arrival I would have given this a 10/10. I stay in lots of hotels in Koln and this rates very close to the top of my list after just one stay. Upfront (in the reservation notes) I asked to make sure my room was cool when I arrived. It wasn't. Upon arrival I switched on the airco and opened the window. Coming back in the room after diner at 1am to get some good sleep, it was still way too warm. Apparently the airco didn't do anything and the room seemed to be continually heated. This resulted in a very bad night sleep and rough start of the day with meetings all morning. My colleague experienced the same. Why ask for 'special wishes' in the reservation if you are not willing to act upon that? I don't understand. On a positive note, breakfast was perfect and staff more than willing to help in other requests.